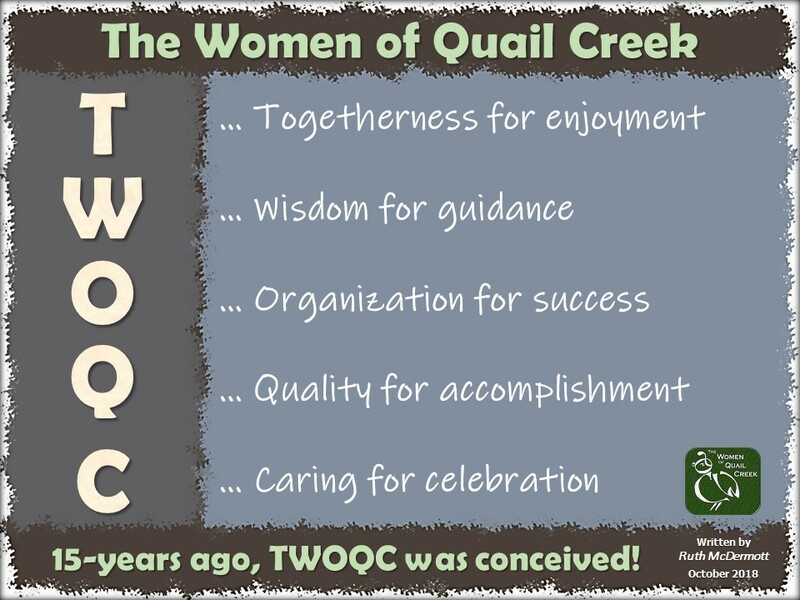 The primary purpose of the Friday Morning Messages (FMM’s) at Quail Creek is to notify The Women of Quail Creek (TWOQC) members and the general public audience about new events and changes to TWOQC’s events, programs, policies, and procedures. It also publishes periodic reminders about those events and changes. FMM’s are published each Friday with the exception of the end-of-year timeframe when the Board of Directors halts business and takes a holiday break. Back issues of the FMM’s can be accessed online utilizing the Archived FMM’s section on the website (www.womenqc.com). FMM’s are meant to inform its members and the general public of a comprehensive schedule of programs, events, and committee activity and goals. FMM’s are technically the President’s Message compiled from shared updates of club events and committee activity. FMM’s contain announcements about events in, or news about, TWOQC. TWOQC is not obligated to publish FMM announcements on behalf of religious, political, fraternal, or any other group governed by entities outside of TWOQC organization. Short reminders included in FMM’s will provide information prior to current or upcoming programs or events. Each of TWOQC’s committees can be listed on the organization’s website with the main contact information, event or program description and external website (if any). As an announcement, program or event description may include an invitation to attend to the organization’s members, and in some cases to the general public.